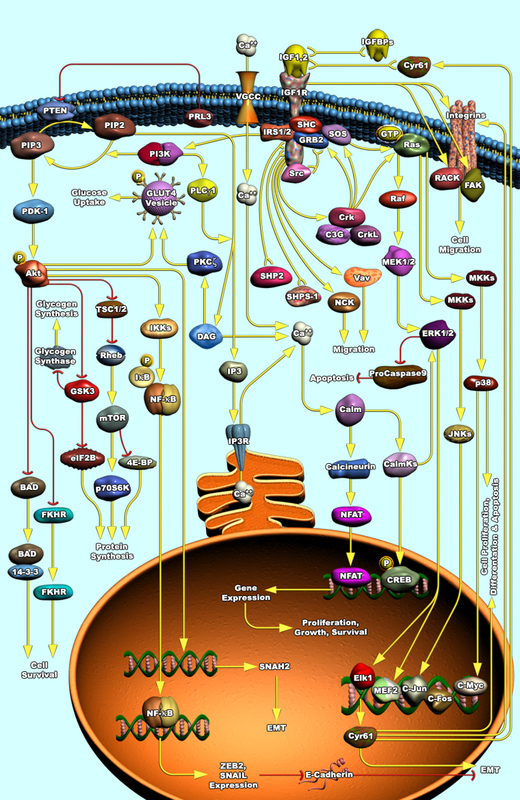 The insulin-like growth factor (IGF) signaling pathway functions in mediating cell proliferation, apoptosis, differentiation, survival, metabolism, and migration. These interactions provide a potent system that regulates many other processes such as cardiovascular, muscle, bone, and brain development. The IGF system comprises of IGF-1 and IGF-2 and their respective receptors, IGF-1 receptor and IGF-2 receptor, as well as six binding proteins, IGFBP1-6. The IGF signaling pathway has been implicated in aging, since it has important roles in many of the functions necessary for growth, metabolism and fertility. It has also been implicated in neurodegeneration, diabetes, and cancer progression. Related antibody arrays - Browse multiplex antibody arrays that detect multiple IGFR1 pathway proteins.